After the initial set-up and plotting of the plants, we could see that at the beginning of week 2 that there were some sprouting from the plants. All the plants were in plastic potting trays and organized in two rows: the first row would be for the plants that needed more sunlight, and therefore were right under the UV rays, while the second row were for the plants that needed less sunlight. Our goal was to make sure to keep the soil as moist as possible without killing the plant and to check for any new sprouting. 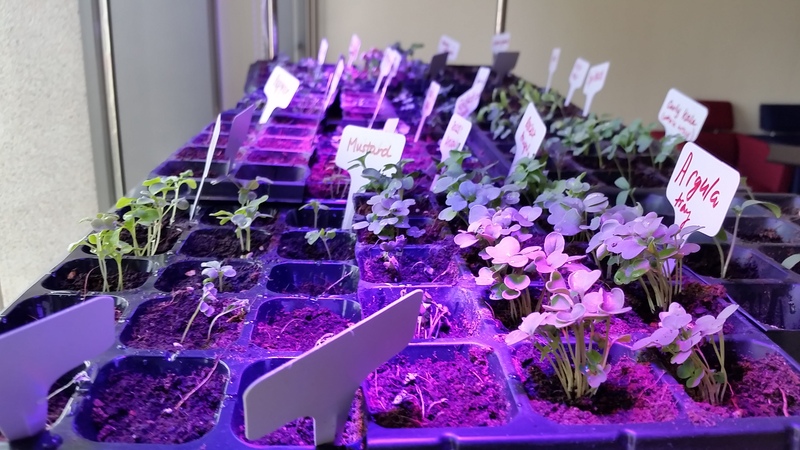 The first thing we noticed was that some of the plants that had already sprouted were already leaning too far towards the window due to the sunlight coming in. With this in mind, we would turn the trays around for that specific plant so that hopefully it would grow in an even and straight line. After a day or two we could notice slight changes that the sprouts began to tilt the other way. Also, after the sprouted didn’t work the first week, we tried to redo it. After watching a YouTube video and going through a quick manual, we placed two rows of seeds inside the sprouter and left the last row empty so water could subside in there. However, after three, four days we noticed that the humidity and the water contained in the sprouter caused the seeds to become moldy, forcing us to discard the seeds. By the end of the week, about half of the planted seeds had sprouted. Our only concern was that the bottom row of plants might not have received enough sunlight since they seemed to be growing slower.